The United States is once again pushing for regime change; and this time the target is Venezuela’s President Nicolás Maduro. It seems that interfering in the internal affairs of sovereign states is a pleasurable exercise for both Democrats and Republicans alike. This probably stems from a sense of righteousness where the self-styled ‘global policeman’ believes it is responsible for the establishment of democracy in nations with autocratic rulers. But Washington also dreads socialism in Latin America as it fears that communism could come next. HYPOCRISY Last year, the US failed to properly assist its own territory of Puerto Rico in the aftermath of hurricane Maria. This was a catastrophe of mammoth proportions that needed mainland assistance and long-term aid but the Trump administration turned a deaf ear to pleas from the islanders. Maybe the US government was indifferent to Puerto Rico because there’s nothing to gain from helping the island nation? Venezuela is different because it’s home to vast reserves of oil, which were considered the largest back in January 2014 – standing at circa 297 billion barrels. Its economic crisis is due in part to low oil prices in that year and in part to concerted efforts by various US administrations to impose economic sanctions against it. And now, even as Uncle Sam squeezes the life out of Venezuelans, it’s virtuously sending aid convoys to feed and medicate them. Washington was unhappy with Venezuela even when Maduro’s predecessor and mentor Hugo Chávez was in office – because of his socialist mindset and irreverence towards the US. But the dislike was greater because he had successfully transformed Venezuela from a neoliberal model into a socialist state. It’s said that under his leadership from 1999 to 2013, poverty dropped substantially, illiteracy had been all but eliminated and childhood malnutrition reduced significantly. Chávez also initiated a pension programme for the elderly, and established education and healthcare programmes for the poor. But even as oil prices kept rising and oil exports increased, the Chávez administration became more vulnerable to price changes. The World Bank once noted that since 2012, 96 percent of the country’s exports and nearly 50 percent of its revenue depended on oil production. When the economy started to crash due to falling oil prices, Maduro printed money and this raised inflation by almost 700 percent. Venezuela’s oil company PDVSA was in dire straits by 2017 and in October that year, it pumped only 1.8 million barrels a day – the lowest in 28 years. US sanctions since 2008 have exacerbated the problems in Venezuela. In January, sanctions froze all property and interests of PDVSA in the United States and prohibited US nationals from transacting with it. More sanctions are imminent as the Trump administration works hand in glove with self-proclaimed right-wing ‘interim president’ Juan Guaidó – a little-known politician from the (not so) Popular Will party. The Lima Group and some other nations have recognised Guaidó as the legitimate president of Venezuela in the hope that Maduro will step down. But they have underestimated the latter’s capacity to dig his heels in further. Meanwhile, reports by some independent journalists who have visited the country contradict the US administration’s claims of widespread hunger and deprivation in the South American nation. Maduro has rejected US humanitarian aid and closed his country’s border with Brazil to prevent the entry of aid convoys, and may do the same with Colombia too. Moscow has accused Washington of trying to arm the opposition in Venezuela since many in the Lima Group have refused to agree to military intervention. 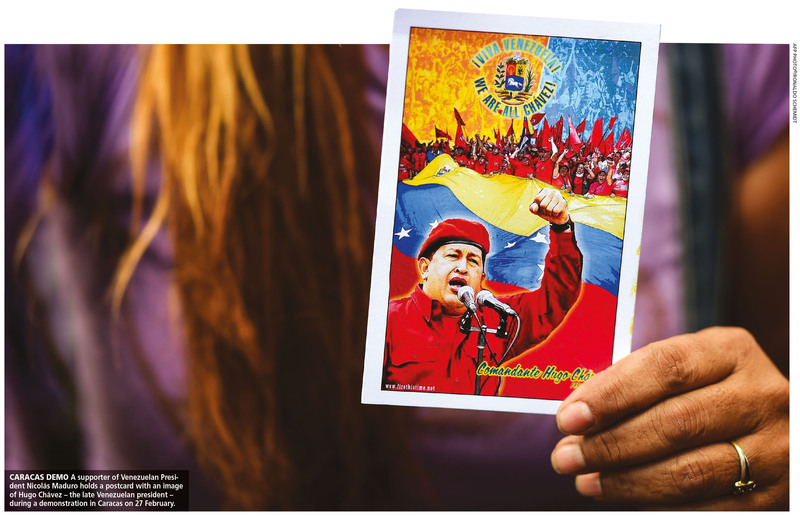 As the standoff between Maduro and the US lengthens, there is a possibility that this mephistophelian plan too could backfire like the failed coup in 2002 to oust Chávez. That incident was closely linked to senior White House officials like Elliot Abrahams who is now handling US policy on Venezuela. HEGEMONY Disastrous interventions in Afghanistan, Iraq, Libya, Syria, Yemen and Cuba among others have given Uncle Sam a rotten reputation. And history is littered with the US meddling in Latin America. Historian John Coatsworth says there are 41 incidents of successful regime change. The mid-19th century land grab during the Mexican-American War resulted in Mexico being deprived of almost half its territory. Overthrowing democratically elected leaders is another popular sport illustrated by the ousting of Jacobo Árbenz of Guatemala in 1954, Brazil’s João Goulart 10 years later and Salvador Allende of Chile in 1973. The US then supported Allende’s successor, the infamous dictator General Augusto Pinochet. The invasion of the Dominican Republic in 1916 and Panama in 1989, plus support for death squads in El Salvador and the Contras in Nicaragua further illustrate Washington’s bad faith in the region. In 2014, a clandestine Twitter network called ZunZuneo was established in Cuba by USAID in a bid to stir unrest among Cubans and prompt regime change. Efforts by the US to destabilise governments it dislikes are well-known around the world. Venezuela is fighting back against Washington’s fake altruism, which is meant to mask its colossal and insatiable greed for oil, as well as regional hegemony.